Joseph A. Natoli Construction Corporation proves stronger than Superstorm Sandy and nears completion of recovery efforts. The New Jersey firm has worked at the international symbol of freedom for twenty years. New York, NY – New Jersey-based contractor Joseph A. Natoli Construction Corporation (Natoli Construction) has completed over three months of extensive repairs, renovations and other post-Superstorm Sandy recovery efforts on Liberty Island. This work is being done on behalf of the National Park Service (NPS), and allowed the Statue of Liberty National Monument to reopen on July 4, 2013. The Monument receives more than 3.5 million visitors annually. Full repairs are scheduled to be completed by October 2013. The superstorm damaged the promenade, grounds, buildings, and much of the infrastructure on Liberty Island. Natoli Construction removed and replaced mechanical, electrical, and plumbing (MEP) systems destroyed by severe flooding. The firm is completing the relocation of all electrical switches and equipment from basement level to a new steel floor, erected 14 feet above ground level to comply with new FEMA regulations and to prevent future damage and loss of power during subsequent storms. It also performed complete overhauls of the island’s administration, concession and maintenance buildings. Prior to the arrival of Superstorm Sandy, Natoli Construction performed a year-long, $30 million project for the NPS to improve visitor experience, accessibility and safety at the Monument. Following completion of these upgrades, the Monument reopened to the public on October 28, 2012. However, it was immediately closed the next day because of the approaching storm, which caused considerable damage to both Liberty and Ellis Islands. The Statue itself was not affected. Joseph A. Natoli Construction Corporation is a full-service contractor/construction manager with broad experience building for private commercial companies, medical and educational institutions, hotels and other projects throughout New Jersey. Founded in 1975, the company has done work for such prestigious clients as the National Park Service, The Statue of Liberty – Ellis Island Foundation, New York Football Giants, Delbarton School and Rutgers, The State University of New Jersey. New Jersey-based construction crew works around the clock in the wake of Superstorm Sandy to restore permanent power to the international symbol of freedom. 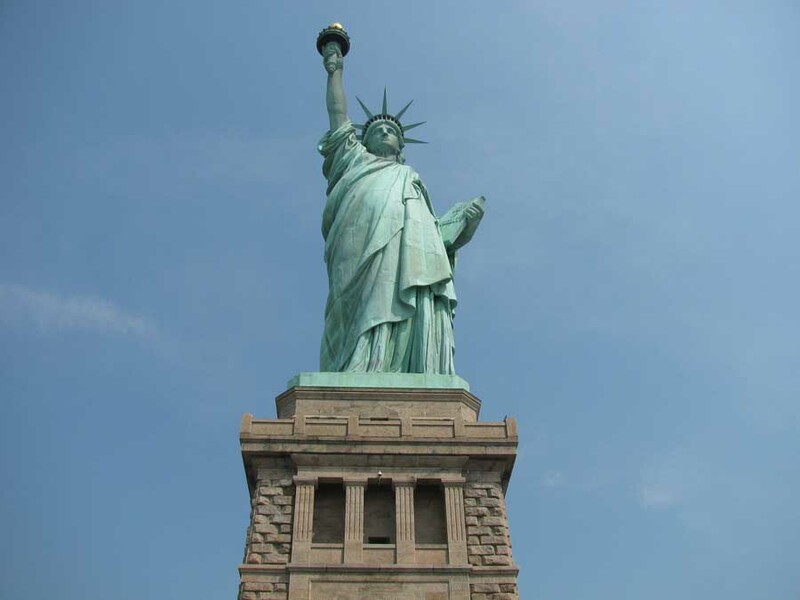 New York, NY – New Jersey contractor, Joseph A. Natoli Construction Corporation, announces that it has restored permanent power to the Statue of Liberty National Monument. All lighting and electrical systems in the Statue, including lights at the torch and crown, have now returned to full operation. Power at the Statue was knocked out by Superstorm Sandy nearly two weeks ago. Temporary lighting to the torch and crown were restored early Friday evening, November 9th. Early Sunday morning, full power restoration was achieved by Natoli crews working in tandem with subcontractor Turnpike Electric, Inc.
Natoli’s team worked around the clock to restore full power to the Monument since it was lost on October 30th. Although the Statue itself was not harmed by the storm, Liberty Island suffered damage to its docks and grounds. Heating, power and emergency generators were knocked out. In the wake of the Superstorm, Natoli has been making necessary repairs to the grounds and power systems. The contractor was already on site performing recent life and safety upgrades at the Statue for the National Park Service. The national monument is closed indefinitely to visitors until full repairs can be completed. The Statue closed in October 2011 to undergo upgrades to visitor safety and accessibility. It reopened on October 28, 2012, the 126th anniversary of its original dedication, and then closed again the next day due to the Superstorm. The storm was not the first major challenge faced by the contractor on this project. “The physical and logistical obstacles we faced with this project weren’t easily solved,” said Paul Natoli, President and CEO of Joseph A. Natoli Construction Corporation. “Having done prior work to early twentieth-century buildings on Ellis Island and to the Statue of Liberty, we knew the site and how to work with this national monument.” Mr. Natoli says the team’s strategy is at the core of their company identity. “Our team is knowledgeable, proficient, and dedicated to creative problem-solving.” In 2004, the contractor performed the initial life safety upgrades necessary to re-open the Monument after the events of 9/11. Temporary lights provided by Musco Lighting will remain in use until the permanent lighting on the grounds of Liberty Island, which were destroyed in the storm, can be replaced. Using state-of-the-art technology, Mills + Schnoering Architects reconfigures the interior of the Statue of Liberty pedestal, resolving a complex project more quickly and cost effectively than with traditional design methods. New York, NY – Mills + Schnoering Architects LLC (M+Sa) used contemporary technologies to upgrade visitor safety and comfort at the Statue of Liberty National Monument. Due to the complexity of the project, M+Sa used these technologies to design the upgrades more quickly, accurately and cost effectively than with traditional methods. When these improvements are complete, visitors will experience the Statue at its best since its dedication in 1886. In 2011, The National Park Service retained a multi-disciplinary design team led by M+Sa to perform these upgrades for the Monument, which will re-open on October 28, 2012 – the 126th anniversary of the Statue’s original dedication. Severely limited space within the Statue’s pedestal posed tremendous challenges for the architects. They designed new staircases and a new elevator to deliver visitors to the observation deck and the crown safely and more comfortably. M+Sa used Revit, a three-dimensional modeling software, to create a virtual model of the entire Monument from laser scans. The interior of the pedestal — 17 feet square at its narrowest and only 27 feet square at its widest – contains massive beams supporting the statue, which further constrict the pedestal’s interior space. Gustave Eiffel, the celebrated engineer of the Eiffel Tower, designed this original support system. Utilizing Revit software, M+Sa configured two new staircases and two elevators within this interior space without touching Eiffel’s steel support beams and enormous iron tie-down straps that hold the statue in place. M+Sa used the Revit model to thread the stairs and elevators through the narrow interior, which has little room for error. Hugh Duffy, project manager at the NPS, stated, “By preserving the Statue of Liberty National Monument’s historic features, we continue to celebrate her origins as well as her enduring presence into the 21st century.” The Statue is a World Heritage Site, the only one in New York State. In 2009, M+Sa, then known as Farewell Mills Gatsch, consulted to the NPS on a project to make the stair rails and protective glass on the stairs leading to the crown as code compliant as possible. In October 2011, the Statue closed to begin work on the current upgrades. This project continues the process of improving safety and accessibility for visitors from all over the world who travel to see this international symbol of freedom. The life and safety enhancements started in 2011 include better fire protection, more accessibility for all visitors, greater comfort, and a superior experience that matches the prestige of the national monument to freedom and liberty. New York, NY, September 19, 2012 – When the statue of “Liberty Enlightening the World” (popularly known as the Statue of Liberty) re-opens to the public this fall, visitors will experience it at its best since its dedication in 1886. A multi-disciplinary design team led by Mills + Schnoering Architects, LLC (M+Sa) is nearing completion on life and safety enhancements to the Statue, which closed in October 2011 to undergo this work. These improvements will allow the international symbol of freedom to continue its legacy of welcoming visitors from all over the world. M+Sa is working for the National Park Service (NPS) to provide stewardship of the Statue for current and future generations. In 2009, M+Sa, then known as Farewell Mills Gatsch, consulted to the NPS on a project to make the stair rails and protective glass on the stairs leading to the crown as code compliant as possible. The current life and safety upgrade project is the continuation of the process to improve visitor safety and accessibility. Hugh Duffy, project manager at the NPS stated, “The Statue of Liberty has been welcoming people as they enter New York Harbor since 1886, and she continues to evoke the spirit of freedom, which is the essence of our great nation. By enhancing safety and accessibility to this National Monument, we continue to celebrate America’s most lasting legacy.” The Statue is also a World Heritage Site, the only one in New York State. “We’ve been working for four years to help preserve and upgrade this great icon of freedom, and we’re proud to be a part of its history. It is an incredible honor to work with the National Park Service to ensure that this Monument will continue to inspire people all over the world,” said Michael Mills, FAIA, Partner, M+Sa. M+Sa is a full-service design firm that specializes in the preservation of historic structures such as the Pearl S. Buck House in Perkasie, PA and Nassau Hall at Princeton University (both National Historic Landmarks) as well as the Louis I. Kahn Bath House in Trenton, New Jersey. The life and safety enhancements will increase visitor safety and fire protection. New stairs and a new elevator make it easier for visitors to ascend to the pedestal’s observation level, which will also be wheelchair accessible. From the top level of the pedestal, visitors can look up and view the double helix stairs leading through the interior of the Statue to the crown as well as the support system designed by renowned French architect and engineer Gustave Eiffel. The project also focuses on accessibility and visitor comfort. A new heating, ventilation, and air conditioning (HVAC) system creates a more comfortable environment as visitors ascend or descend the stairs. To design these new features within the pedestal’s limited space, M+Sa used three-dimensional building information modeling (BIM) and laser scanning technology. Designed by French sculptor Frédéric Bartholdi, the Statue of Liberty was given to the United States on October 28, 1886. The first public elevator was installed in 1906 to provide access to the top of the pedestal. In 1933, President Franklin D. Roosevelt transferred the Statue of Liberty National Monument to the care of the National Park Service. Five years later, the first major rehabilitation was completed on the statue, pedestal, base, and walkways. The monument received additional work between 1984 and 1986, notably replacing the torch and strengthening the outstretched arm. April 2009 marked the beginning of further improvements to the double helix stairs leading up to the crown, which reopened on July 4, 2009 for the first time since the terrorist attacks of September 11, 2001. Mills + Schnoering Architects, LLC is a full service architectural firm with broad experience in design, planning, and historic preservation. Founded in 2011 by former principals of the award-winning Farewell Mills Gatsch Architects, the firm offers expertise in the fields of cultural facilities; courthouses; campus planning and design; and the preservation, restoration, and adaptive use of historic buildings and sites. Other preservation work on National Historic Landmarks includes St. Elizabeths Hospital in Washington D.C; Georgian Court in Lakewood, NJ; Merchant’s Exchange in Philadelphia, PA; and Nassau Hall at Princeton University, NJ. Atkins North America, Inc. (Construction Manager); Joseph A. Natoli Construction Corporation (Contractor); Keast & Hood Co. (Structural Engineer); Joseph R. Loring & Associates (MEP Engineer); Hughes Associates, Inc. (Fire Protection Engineer); VDA – Van Deusen & Associates (Vertical Transportation Consultant); Becker & Frondorf (Cost Estimator); The Lighting Practice (Lighting Designer); The RBA Group (Civil Engineer); Schnabel Engineering (Geotechnical Engineer); David Evans Associates (Value Analysis). Since 1916, the American people have entrusted the National Park Service with the care of their national parks. With the help of volunteers and park partners, the NPS is proud to safeguard these nearly 400 places and to share their stories with more than 275 million visitors every year. One of those places is Statue of Liberty National Monument. Located on a 12-acre island in New York Harbor, the statue of “Liberty Enlightening the World” was a gift of friendship from the people of France to the people of the United States and is a universal symbol of freedom and democracy. The Statue of Liberty was dedicated on October 28, 1886 and designated as a National Monument in 1924. The Statue is visited by nearly 4 million people each year. The Statue of Liberty has now closed for a year to be reconstructed. It was closed on 28 October after a celebratory event. The costs of the renovation is estimated at about $ 27.5 milion (19 milion euros). There will be new elevators and stairs towards the crown of ‘Lady Liberty’. The Statue of Liberty was a gift from the French people to the United States of America and located on Liberty Island opposite New York. Each year around 3.5 million tourists come by ferry to Liberty Island. You can catch a ferry to the Statue of Liberty from Battery Park at the southern end of Manhattan. The framework for the Statue of Liberty was made by Eiffel (in France), the creator of the Eiffel Tower. The structure is 93m high in total. It was inaugurated on 28 October 1886.